The capital city of Ukraine (formerly part of the Soviet Union), and actually spelled 'Kyiv' in Ukrainian these days, though I'll stick to the internationally more recognizable old spelling here. In addition to the range of dark attractions the city offers in itself, it is of particular interest to dark tourist as it serves as the base for tours to Chernobyl. Kiev has also been in the news a lot due to the Maidan protests of late 2013/early 2014 and the brutal crushing of it in February 2014, involving snipers, which left around a hundred dead and over a thousand injured. The square is still a centre of the movement, with numerous memorials that have sprung up around it. 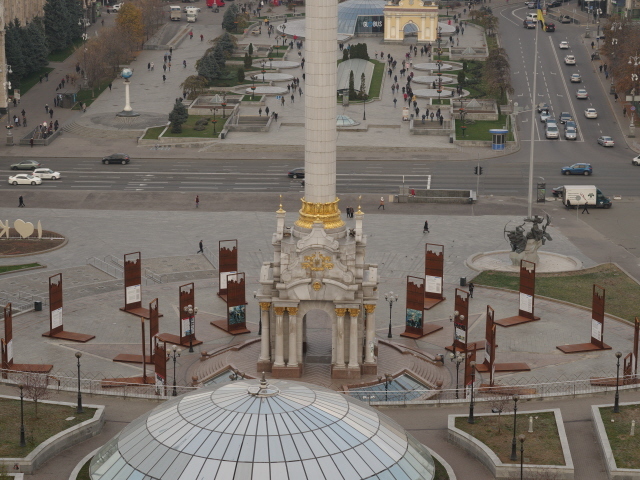 In addition, the current war in eastern Ukraine, which started in the wake of the protests and the former president's ousting, is also visibly reflected on the square (also at the war museum and, less dramatically, across the city). 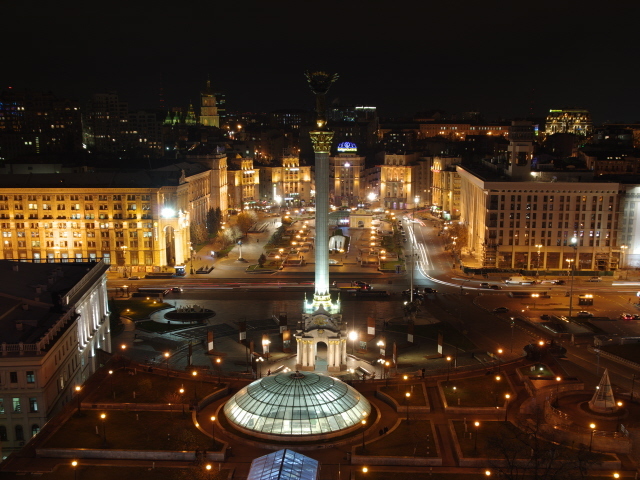 More background info: Kiev (or “Kyiv” in Ukrainian spelling) is one of the grand old cities of Eastern Europe. Its history spans over a thousand years, during which it has been part of changing empires, including the Grand Duchy of Lithuania and the Kingdom of Poland. But it really started to prosper and gain importance as part of the Russian empire in the 19th and early 20th century, and later the Soviet Union, even though there have always been movements advocating independence. It is a real crossroads kind of place – between the big eastern power and the rest of Europe. So what is happening right now actually has its roots in a long history and conflicting traditions. 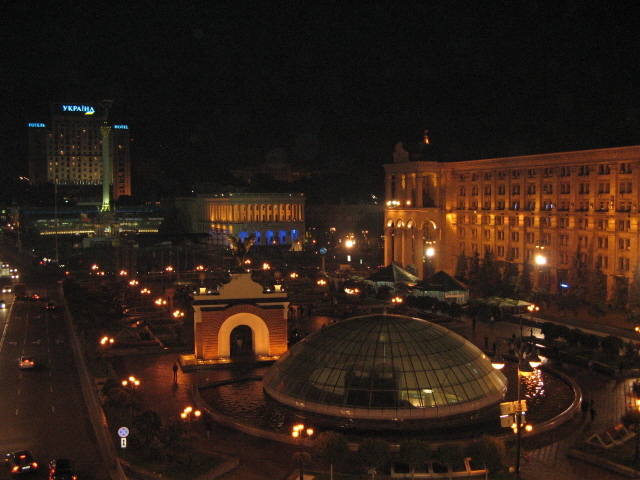 Within the Soviet Union, Kiev was the third largest and third most important city after Moscow and Leningrad (today's St Petersburg), also in economic terms. The city suffered badly during Nazi Germany's invasion of the USSR in WWII. An especially tragic fate awaited the city's Jewish population – namely in the massacres of Babi Yar. The German occupation lasted from September 1941 to November 1943, when the Red Army liberated Kiev. Yet much of the city lay in ruins. The Nazis didn't retreat back westwards without inflicting further massive destruction on Kiev (cf. also e.g. Warsaw). 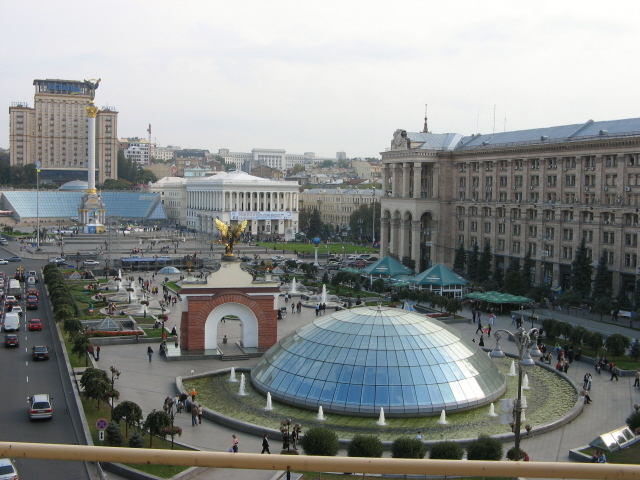 After a difficult post-war period Kiev grew back to its former status within the Soviet Union, also as a transport hub and centre of the arms industry. An industrial accident of the highest order, however, threatened the city in the form of the Chernobyl disaster in 1986. Chernobyl NPP is only a good 60 miles (110 km) north of Kiev. But luckily for Kiev (and unluckily for Pripyat and southern Belarus), most of the radioactive cloud was blown away from Kiev in a more northerly and westerly direction. Following the collapse of the Soviet Union in 1991, Kiev became the capital of the now independent state of Ukraine. Its significance within this new state grew even more, and it is now a city of officially nearly 3 million inhabitants (though estimates put the real, though unofficial, population number much higher). As the political hub of the country it also saw the main action during the 21st century “revolutions” in Ukraine. First the so-called Orange Revolution in 2004-2005, in which the pro-Western Viktor Yushchenko eventually came out the winner to become president for the following years. From 2010, however, his old opponent Viktor Yanukovych bounced back and led the country in a more pro-Russian direction once again. Protests against this, and against widespread corruption, gathered momentum in 2013 and led to the Maidan protests, also called “Euromaidan”, from November onwards. These protests called for more integration with Europe, even striving for EU membership. After the tumultuous and violent phase of February 2014, Yanukovych was ousted and fled to Russia. The new government that then formed in Kiev, however, was not recognized in the eastern parts of the country, where a nasty civil war soon began to unfold. And this conflict is still ongoing (see under Ukraine in general). The Black Sea peninsula of Crimea, meanwhile, was annexed by Russia (or “reintegrated into Russia” as they would have it). However, other than the ubiquitous Ukrainian flags you now see everywhere, and all the new memorials and posters on the Maidan, Kiev remains more or less untouched by those troubles in the south and east (except economically). So it is still (or rather: again, at least for the time being) quite safe to travel there. Tours to Chernobyl, the main reason for dark tourists to come here, were never really affected by the revolution and the war in the east in any case. The Maidan, or Independence Square ("Maidan Nezalezhnosti" in Ukrainian), remains a place of special interest with regard to the recent protests and violent clashes here (see background). When I was there in May 2015, the burnt-out former Trade Union Building, which had served as the HQ for the protests and thus became a target for the crackdown, was covered in huge posters from street level to the roof, proclaiming patriotic messages. Behind these, the building is presumably undergoing refurbishment. UPDATE 2018: this has meanwhile been completed. And then there are all those memorials for the people who lost their lives in the crackdown on the protests in February 2014. Some consist just of a laminated photo attached to a wall or column, others are quite elaborate and involve objects such as riot police metal shields or even swords. Ukrainian colours and red candles are everywhere. A recent addition I found was a small photo and set of red candles in memory of Boris Nemtsov, the Russian opposition politician who was murdered in the heart of Moscow on 27 February 2015. He had been critical of Russia's involvement in the war in eastern Ukraine. UPDATE: when I was back in November 2018 I could no longer find this little shrine. To the west of the square a new larger scale memorial and flower bed arrangement was being set up in May 2015, but I couldn't yet make out what it was supposed to be. When I went back in 2018 I found out: it's a giant clock! At the foot of this slope some recent marble memorial stones have been placed. Yet more of these slabs on the other side of the street list the names of the February 2014 victims. I found it all very touching and a stark reminder that Ukraine is a country that has not only suffered such tragic events so recently,but that it is still a country at war. UPDATE: when I was back in Kiev in November 2018 I found that the improvised elements had been replaced by rather official looking metal stelae with elaborate information panels on them. Apparently they are a stand-in for a future museum about the Maidan protests and its context. The pathos-laden official designation “National Memorial Complex of the Heroes of the Heavenly Hundred – Museum of the Revolution of Dignity” (Maidan Museum, for short), and the style of the bilingual (Ukrainian, English) panels now already in place, indicate that this will probably be a quite propagandistic and politically charged institution. Otherwise, however, in most parts of the rest of the city you wouldn't guess there's ever been any sort of crisis. Life seems to carry on as normal. Except that I saw a lot more Ukrainian colours than back in 2006, when I first visited Kiev. There are now not only countless Ukrainian flags hanging from windows and balconies everywhere, the two colours can also be found on walls, even painted on tree trunks, and on little posters by the escalators down to the metro that say “one country”. One inanimate casualty of the protests was the red marble Lenin statue that used to stand on a plinth near the intersection of Khreschatyk and Shevchenko Avenue (opposite Besarabsky market hall). This was toppled and destroyed by protesters in December 2013. It was apparently the last such specimen left within Kiev. 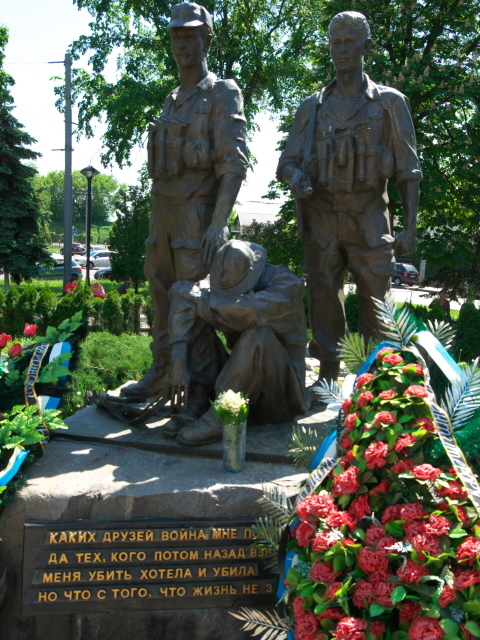 (More Soviet statues and monuments were destroyed in other parts of Ukraine – but the one in Chernobyl town survives till this day!) These days there is even a law in force that forbids any display of Soviet symbols … unless they are part of a museum. But this rather revisionist policy means you will no longer be able to pick up those hammer-and-sickle-adorned furry hats or other real or fake Soviet-era souvenirs in Kiev any more. However, there are still plenty of reminders of the Soviet era, albeit mostly in less monumental and obvious forms. Mostly these are expressions in architecture. One of the most stunning examples of Soviet futurist (also brutalist) architecture is the tubular concrete shape of Hotel Salyut (or "Salute") on Slavy Square south of the centre (about halfway en route to Pechersk and Rodina Mat). Last time I was in Kiev I also stayed there and so could marvel at the equally futurist interior design too. The rooms was unremarkable, but the reception area/foyer and the restaurant were fabulously “retro futurist”. Just a few steps away to the south is the Park of Eternal Glory, with a Soviet war memorial in the form of a tall obelisk and an eternal flame (still burning!) as its centrepiece. The more recent Holodomor memorial is also here. The park is a popular spot for gatherings, especially wedding and hen night parties. So the people-watching here can be fantastic too at certain times (weekends especially). Another leftover from the Soviet days is to be found at the other end of the city centre: the Arch of Friendship (or Friendship of Nations Arch), a huge silver arc towering over the river in a park a bit to the north of the top of Khreschatyk (the main central city street). Also at this park you can find a few surviving Soviet monuments of typical socialist glorifying style. Remarkable, despite the current political climate between Ukraine and Russia (hardly friendship), these monuments are still standing. On a much smaller scale, plenty of reminders of the Soviet days can be found in the metro stations of Kiev (look out for Soviet stars and hammers-and-sickles). The trains themselves are also vintage Soviet (the ones I rode dated back to the early 1970s). Using the metro is thus generally quite a special experience. Moreover, many of the stations lie so spectacularly deep underground that the (fast-moving) escalators take minutes to reach the bottom (especially at Arsenalna station – where the tracks lie over a 105m/350 feet beneath street level!). Just outside Arsenalna you can see the old Arsenal building that sports a memorial plaque and preserved bullet holes and shell scars from the 1918 Arsenal Uprising (and event that helped the Bolsheviks gain the upper hand in the Ukrainian-Soviet War). On the square in front of the station another memorial to the event is crowned by a vintage heavy machine gun. All in all, Kiev has enough to offer to keep a dark tourist entertained for more than just a single stopover day before or after a Chernobyl tour. Do give it a chance. For me Kiev is one of the most likeable metropolitan cities in the world (see top-10 cities). Location: in the northern central part of Ukraine on the river Dnieper, some 75 miles (120 km) south of the border with Belarus, 280 miles (450 km) north of the Black Sea city of Odessa, 300 miles (480 km) east of Lviv near Poland, and ca. 420 miles (680 km) to the city of Luhansk in the war-torn eastern parts of Ukraine near the border with Russia. Access and costs: Quite easy to get to by plane, and also overland; not necessarily expensive. Details: Kiev is easily reached by plane, and the national carrier Ukrainian Airlines offers competitive rates (if booked well in advance). Many other airlines serve Kiev's Boryspil international airport as well. Taxis into the city are well organized and not overly expensive, and there are also buses (but no trains). From the west at least, you can also get there overland – less so from the north (via Belarus), let alone the east or Crimea in the south. When I was there in 2006 a couple (who were also on my first Chernobyl tour) from Germany had driven all the way to Kiev in their own car. So it is doable. But in order to do that you probably should at least know the language a little and most definitely be able to read Cyrillic. The latter is generally a good idea (and really not difficult to learn), even though in Kiev you can these days see many signs in Latin script and even in English as well. Getting around is also not difficult. Many parts are quite walkable – and walking is a delight in this splendid city, at least in the central parts (the depressing concrete sea of prefab residential blocks on the other side of the river is a different matter altogether). For longer distances (e.g. out to Babi Yar) the metro is convenient, safe, efficient, fast, extremely cheap and fun to use. Trams, buses and trolleybuses you will probably never have to use. Accommodation options in Kiev cover the full range, from camping to top-of-the-range hotels (with full-on Western luxury pricing) – and anything in between. Given the current exchange rates to the troubled hryvna, price levels are generally favourable from a Western point of view (though not so from e.g. a Russian perspective). When I was in Kiev in 2015 I used the architecturally outstanding Hotel Salyut (see above). The room was quite plain, but the Soviet-era interior design of the public areas is worth seeing. Moreover, the hotel is ideally located for the Holodomor memorial and also the nearest of all classic larger hotels to the Rodina Mat and war museum as well as the Pecherska Lavra. The Maidan is also easily reached by metro from Arsenalna station a short walk north from the hotel. On my return trip in 2018, I stayed at the similarly reasonably priced Hotel Ukraina, a classic Stalinist high-rise edifice that towers over the other side of the Maidan. If you are lucky enough to get a room on a higher floor facing the square, you get superb views over it. As for food and drink: bargains can be had at lower-key local eateries and the markets; but it helps if you know a little Ukrainian/Russian. Upscale restaurants with convenient English menus can get pricier, but still not quite on Western levels at the moment. Apart from traditional Ukrainian restaurants there is now a fairly decent international range available in Kiev (as in Kazakhstan, sushi appeared to be all the rage when I was there last). Obviously the more exotic tastes also cost more here. Time required: A couple of days, a weekend perhaps, may do for an impression and for covering the city's dark sites – if only at a push. If you want a more leisurely experience and time to savour this magnificent city in more depth (and not just the dark bits) then a few more days can easily be whiled away here. For a tour to Chernobyl you have to factor in at least another day (preferably longer, in order to go on a more in-depth multi-day trip). And yet another one for the tour to the Pervomaisk strategic missile base. Combinations with other dark destinations: Kiev is the base for tours to Chernobyl, one of the greatest attractions of dark tourism – and thus the most likely reason why dark tourists come to Kiev at all. But while you're in the city, why not take in the other dark sites in Kiev and its vicinity too. Closer to the city (stricly speaking still within it – but still way out of the centre) is the National Museum of Aviation at Kiev's “other” (these days mostly domestic) airport Zhulyani. The museum is round the back, not where the terminals are. To get there is's simplest to go by taxi (it only costs the equivalent of 3 EUR or so for the 5 miles/8km ride from the city centre). Alternatively, minibus 220 also goes straight to the door (e.g. from near Demiivska M2 metro station). The trip is especially worth it for those into Soviet-era aircraft, of which this museum has a fantastic collection, including all types of MiGs (from 15 to 29), a whopping three (!!!) versions of the Tu-22M “Backfire” supersonic swing-wing bombers, a Tu-142 (a version of the Tu-95 “Bear” strategic bomber that was probably THE Soviet symbol of the Cold War and is still in service today), as well as a few very rare, and very bizarre experimental aircraft. Open Wed-Sun 9 am to 5 p.m. (7 p.m. in summer), admission 30 UAH, photo permit 10 UAH, entering certain planes is also possible for an additional fee of 5-10 UAH. Combinations with non-dark destinations: Kiev makes a fantastic city break as it is a place that combines an almost Parisian grandeur (wide boulevards, splendid parks and glorious architecture) with former socialist "charm" (some of the era's architecture is quite amazingly outrageous) – and of course old Slavic treasures of Orthodox cathedrals and monasteries. Quiet a bit of the "old" architecture isn't so old in reality. Almost all of the gold-topped grand churches were rebuilt, some quite late, following the devastation of the city by the Nazis in WWII (and the neglect of anything church-related during the Soviet times). But even so, now it all certainly looks picture-book historical, tourists are happy. Can you have too many gold domes? Apparently not in Kiev – walking around near the Pecherska Lavra I once saw a whole courtyard full of newly-made gold domes waiting to be put on top of something. Outside the city there are further typical Eastern European sights such as old monasteries, to which day trips from Kiev can also be arranged. Further afield, the most prominent tourist area of Ukraine has to be the Black Sea coast, including the famous coastal town of Odessa. The fabled Crimean peninsula, on the other hand, is now severed from Ukraine since Russia annexed it in March 2014.